MANILA, Philippines – Cardinal Luis Antonio Tagle shared how Pope Francis lost his words and was trapped in complete silence, upon hearing the stories of those survivors who lost their loved ones due to Typhoon Yolanda and the Bohol earthquake that hit Philippines last year. After Pope Francis officiated a Mass in an open field near Tacloban airport, which was attended by approximately 200,000 people, he visited the archbishop’s residence in Brgy. Arado in Palo, Leyte. According to reports, the visit was intended for a lunch meeting with 30 survivors of one of the strongest typhoons that hit the country, and the 7.2-magnitude quake that struck the Visayas region. In a report from ABS CBN News, Tagle shared that the meeting was an “intimate encounter” which left Pope Francis speechless after hearing their stories. “He was suffering. When I asked him, ‘Do you want to say a few words before we go?’ He said, “But what can we say?’” Tagle conveyed in a press conference which happened on Saturday night. “The silence of someone before this mystery of suffering. I thought he would repeat his central message of his homily, but before these 30 persons, he, too,http://kickerdaily.com/wp-admin/post.php?post=123451&action=edit&message=6http://kickerdaily.com/wp-admin/post.php?post=123451&action=edit&message=6http://kickerdaily.com/wp-admin/post.php?post=123451&action=edit&message=6http://kickerdaily.com/wp-admin/post.php?post=123451&action=edit&message=6 was reduced to silence—the communion and solidarity that happens in silence,” he added. In his homily for the mass, the Pope decided to speak from the heart using his native Spanish language, instead of reading his prepared homily in English. “I’d like to tell you something close to my heart. When I saw from Rome that catastrophe I had to be here. And on those very days I decided to come here. I am here to be with you – a little bit late, but I’m here,” the Pope said in Spanish, which the translator immediately translated to English. “I have come to tell you that Jesus is Lord. 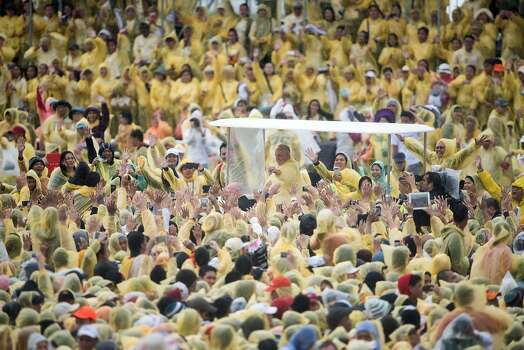 And he never lets us down,” the Pope added while facing the hundreds of thousands in attendance at the mass, despite the rain and bad weather. Tagle further said, that while they were on their flight back to Manila, Pope Francis said his trip to Tacloban had been a learning experience. “This visit is really for me. I’m learning,” Pope Francis told Tagle. “That’s how to be a pastor—you learn and you never stop learning. You bring it to your heart and you reflect on it on the light of the word of God,” Tagle said. Will Next School Year Start in September?